See more objects with the tag personal, gold, flowers, personal adornment, adornment, accessories, jewelry, hair, cornucopias, brooch. See more objects with the color darkolivegreen black dimgrey grey lightyellow or see all the colors for this object. This is a Brooch. It is dated ca. 1837 and we acquired it in 1960. Its medium is hair, gold, ivory, seed pearls, pailettes. It is a part of the Product Design and Decorative Arts department. Ornamental hair work became popular in seventeenth-century England, but reached a peak in the 1800s as part of elaborate mourning rituals. Wealthy Victorian women practiced hair work as part of their leisurely pursuits, often using locks from a deceased friend or relative to create a tangible reminder of that person. Alternatively, hair could be sent to a professional tradesman, but practitioners could be deceitful. Some tradesmen replaced human hair with sturdier horsehair or sold ready-made pieces, disregarding the original strands’ sentimental value. There were two main types of hair work jewelry: hair transformed into a picture and hair plaited into a design. This brooch, which has a matching bracelet in the museum’s collection, displays both styles: the central motif is a horn-of-plenty made of hair, secured in a glass case and surrounded by tightly woven strands. The outer hair would have been plaited around a mold, such as a knitting needle, then boiled and dried before the mold was removed and the piece was taken to a jeweler for a gold clasp and fittings. 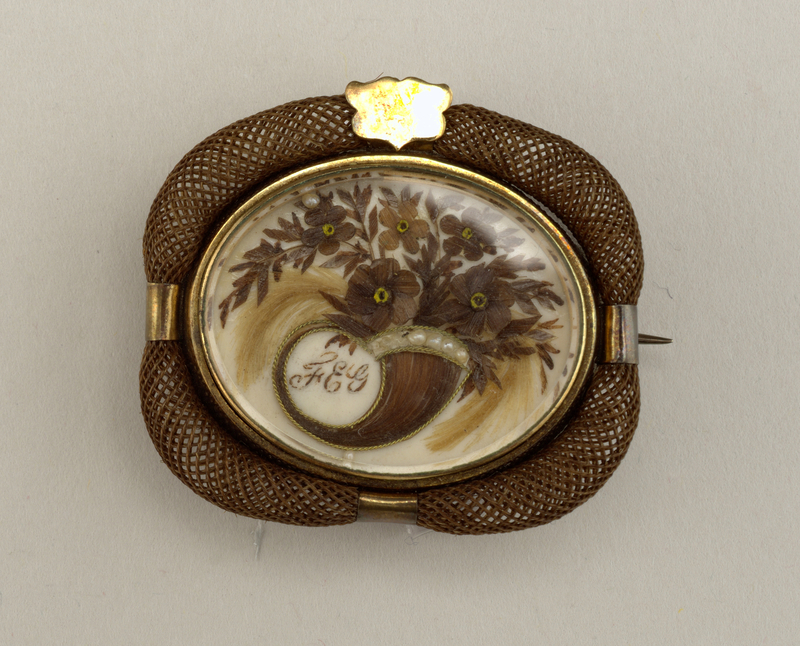 Hair work jewelry was often based on existing designs, and a form similar to this one is included in Charles T. Menge’s 1873 catalog in the museum library. On front: "FEG"; inscribed on back: "MARY ANN GROVES 1804-1837."